Wardrobe Treasures is a multi-designer store in Meherchand that stocks outfits and accessories from across the country (read; Hyderabad, Mumbai, Kolkata, Bangalore). Their collection of clothes starts at INR 3,500 and their jewellery at INR 2,500. 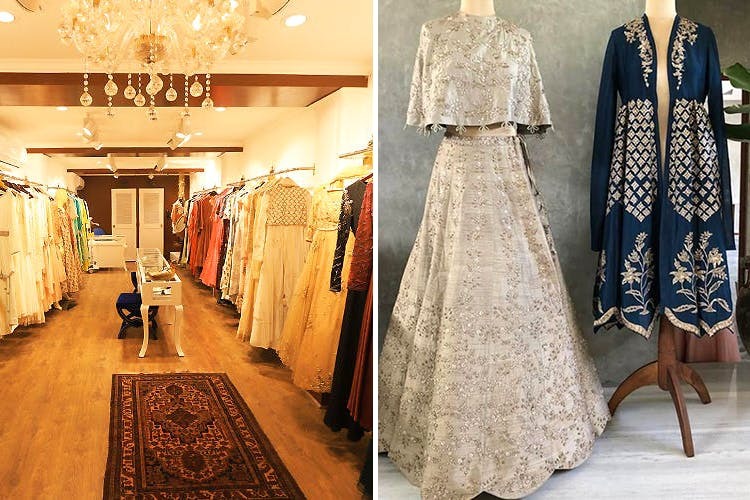 Wardrobe Treasures is a family enterprise that launched its first brick-and-mortar store in Kolkata and opened its flagship store in Delhi about a year ago. If you’re someone who’s looking for designerwear at relatively economical prices and for outfits that can be customised according to your size, colour and a certain style, look no further than Wardrobe Treasures. They’ve got ready-to-wear lehengas, suits, shararas and gowns by designers like Jayati Reddy, Bhavya Bhatnagar, Sahil Kochhar and labels like Zoraya and Niqaasha. In case you’re looking for indo-western casuals, or for ethnic outfits you could wear before or after D-day, you should definitely drop by this store. While there’s no dearth of outfits in bright colours (and with heavy embroidery), we also found a lot of fuss-free pastel and minty green clothes with just a bit of gold and silver. What’s more? They’ve got semi-precious jewellery, polki sets and head accessories by Divya Chugh and Maira (to name a few). Juttis, customised potlis, clutches, perfumes and beauty care are just some of the many things that make Wardrobe Treasures a one-stop shop for all your wedding and trousseau needs. We wish they stocked clothes and accessories for men too.